I became quite picky with restaurants since I have decided not to chew any meat that comes from land animals. Coming from a very productive meeting in the morning, my friend and I decided to have lunch out instead of having the usual cafeteria food. 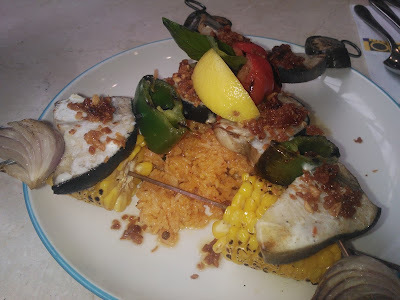 We had Crispy Garlic Butter Butter Blue Marlin "Shish Kabobs" skewered with bell peppers, zucchini and red onions with corn on a cob and served with party rice and fresh lemon. It's PhP 350 only and good for sharing. We earned our meal that came with onion soup as we walked from our office to the Ayala Triangle Gardens and back. Doncha love cloudy days like this?